Selecting the best travel backpack to travel around the world can be one of the most important decisions you make. You might be living out of the travel backpack for a year on your, you guessed it, gap year. It’s vital that you get it right and get a rucksack or backpack that is not only a great design but a good fit for you. Over the last 8 years I’ve tried and tested many backpacks in all sorts of conditions. I’ve been to all 7 continents, dragged backpacks through the Arctic Circle, thrown them between boats in Fiji and everything inbetween. 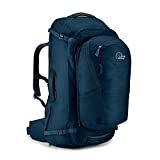 What Size Backpack Do I Need? Is a 40 Litre Backpack Enough? I’m Travelling Light and Need a Minimalist Backpack. 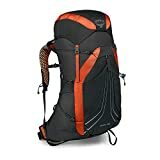 What is the Best Carry On Backpack and Rucksack? What is the Best Day Pack? What is the Best Laptop Backpack? Do I Need a Rucksack or Backpack With Wheels? Are Wheeled Backpacks Necessary? Ultralight Backpacking? You’ll need a Ultralight or Lightweight Backpack! What is the Best Backpack Design? A lot of people ask “what’s the best rucksack for 3 or 6 months of travel?” or “what’s the best backpack for a trip to South East Asia or Australia?” Both of these questions are somewhat irrelevant. Going on a very short trip might mean you only need a small backpack such as 30/40lt IF you travel light but I take the same backpack on one month trips as I do 12 month trips. Just because you have 60 litres, doesn’t mean you have to fill it completely. You might want to consider that you will do a month trip now and then end up getting the bug and travelling for longer. Why not just buy one decent bag for life? I’ve been using the same backpack for years. Sometimes it weighs 8kg, sometimes 22kg. Having a bigger backpack that’s slightly empty just means you’ll have more room to find things. Anyway, let me help you choose the best backpack for you. Yes boys and girls, size does matter, especially on a long round the world trip or Gap Year. However, it all really does depend on you and your travel style. Some people are flashpackers and must take 6 pairs of shoes in which case you might want a bigger backpack. Some people purposely take a smaller backpack to limit how much they are carrying around with them in case they get tempted to shop. General rule of thumb would be anything around the 60 litre mark if you’re doing a round the world. I know some people who travel light with 40 and some who travel with 70. If you’re doing a short trip or going for the minimalist approach to packing, a 60 litre bag will be too much. You can also save money if you have a backpack that is the right size for a carry on and can avoid checked luggage fees. The backpacks below should be the right size for carry on but please be aware that luggage restrictions can vary by airline so please check both size and weight limitations. These days a lot of backpacks come with a 10-20 litre detachable day bag. Pretty good idea for when you need a small bag for treks or excursions. I’ve found it useful to have my own day pack in addition to the one that comes with my backpack. I personally use a Berghaus Freeflow for day hikes as it has a fixed curve back that allows air flow, comfortable on the hips and is hydration sack compatible. Just note this is a top loader. 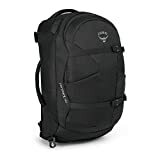 I’ve since started using an Osprey Radial as an all round day pack in addition to my main pack when I need to take a laptop as it has ventilation system also and a padded laptop compartment. If you want something between the two I’d go for the Berghaus Remote. It’s not rigid like the Freeflow and doesn’t have a laptop compartment like the Radial but it’s still durable, lightweight and a great day pack for extra storage and day trips. If you’re a fellow digital nomad or perhaps will be working while you’re away, chances are you’ll need a suitable backpack for your trip. Your laptop is more than likely one of the most expensive items that you’ll travel with so it’s important to get a laptop backpack that is fit for purpose and will provide adequate protection. Personally, the Osprey Radial is a winner as it’s perfect for commuting, cycling or just using it as a travel day pack! Despite the potential downside of wheels adding extra weight to the overall pack, the added benefit of being able to wheel you’re backpack means that often the extra weight will actually be an asset. Just make sure that the wheels on the backpack are decent, like on the Osprey packs which have a durable chassis and big wheels meaning that they can tackle any kind of terrain. Paths and roads in lots of countries won’t be perfect but still decent enough for you to wheel a backpack around. The most important design feature of the backpack is how it opens. The best kind are backpacks that open like a suitcase. After backpacking for a long time I’ve found that ones that zip most of the way round are the easiest to travel with as you have faster access to all of your belongings. 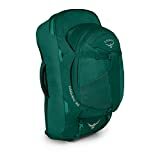 The alternative is to buy a backpack that’s a top loader but a lot of these will also have access from the bottom (such as the Berghaus Wilderness). 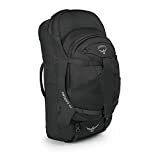 As they are both travel packs, I recommend the Osprey Farpoint. I hate to get all Harry Potter on you but you don’t pick the backpack. The best backpack picks you. Make sure that you are getting the correct sexed bag. Female backpacks tend to suit, well females. We’ve compiled a list of best backpacks for women. If you are a tall female it might be worth looking at a male backpack as it might be a better fit. Go in to your local outdoor store and try the backpacks on. You’ll just feel which one is right for you. If in doubt just ask the sales assistant who looks like he doesn’t want to be there. As I have stated before, the best backpack is one that opens like a suitcase to allow easier access and packing. All of these backpacks are available on Amazon. As there are various stockists and prices, all of the links below link to all available options for the mentioned backpack so that you can search for the cheapest price. For our North American readers, Berghaus products can be harder to find over on that side of the pond so I would strongly recommend the Osprey Farpoint or Osprey Fairview (40l if you want a carry on or larger for longer term travel). The Osprey Farpoint (or the newly released female version, Osprey Fairview) offers all the benefits of a solid, dependable travel backpack combined with the ease and versatility of a suitcase. Available in 40, 55 or 70 litre capacity options, there is a Farpoint rucksack to suit every type of adventure. The 40L size conforms to the EU maximum carry-on luggage size dimensions, while the bigger versions come complete with a detachable “zip and clip” day packs. All versions offer the clever design touches you would expect from Osprey such as internal pockets, mesh covers and padded straps and carry handles. The Berghaus Trailhead offers 65 litres of internal space and features the Berghaus signature BIOFIT backsystem for improved fit and comfort. Fully customisable to help you find the perfect level of comfort, the Trailhead is suitable for a wide range of terrains and destinations. It also comes with plenty of additional storage features including attachment points on the lid, fixed side pockets, bottle pockets, a base compartment with bivi divider and a top lid pocket. 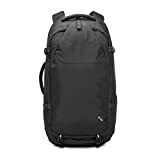 Perfect for multi-day backpacking adventures across all kinds of terrain, the Berghaus Wilderness rucksack offers 65 litre capacity of internal space, as well as a separate 15l capacity in the two expansion side packs. Utilising the Berghaus BIOFIT back system it offer fully customisable comfort and a pre-curved hip belt for added support and correct weight distribution. The rucksack also has plenty of additional storage pockets and compartments to keep your belongings safe and secure. Available in 60 or 80 litre options, the Sojourn from Osprey can be rolled with ease or used as a backpack. Using Ospreys signature AG AntiGravity™ inspired, trampoline suspended mesh backsystem, the rucksack can be fully customised to increase comfort. With an injection moulded HighRoad™ chassis, sealed bearings in the wheels and ErgoGrip™ handles, carry your belongings is easy with this wheeled rucksack combination. It also features compression straps and side-wings to reduce bulk and retain stability. Combining the functionality of a suitcase with the practicality of a backpack, the Deuter Transit comes in a variety of sizes that are perfect for all types of terrain, and features the unique Vari-Quick backsystem for custom made comfort. The 50 and 65 litres Transit rucksacks feature a useful detachable day pack with a 12 litre capacity, as well as waterproof pockets to keep your important belongings safe from the elements and a large base compartment for shoes or sleeping bags. The U shaped zipped opening makes accessing your belongings quick and easy. This bag can be carried like a rucksack or across you shoulder like a carry-on and offers 40 litres of flexible space to keep your belongings safe. The stashable harness, ergonomic carry handles and compact size mean it is easy to switch between bag and rucksack as and when you need to. With a dedicated laptop sleeve, internal mesh pockets, compression straps and an easy to access front pocket, the Lowe Alpine Carry On is just right for travellers who don’t want to stow their luggage. Perfect for round the world adventures, the Lowe Alpine AT Voyager is a large, versatile backpack that is comfortable to carry and easy to access. With tamperproof locking zips and a host of internal compartments it is also completely secure. The detachable day bag means you can leave your belongings behind when you go on day trips and excursions, and the ergonomic hip belt and adjustable shoulder straps make it easy to find the right settings to ensure your comfort even when it is fully loaded. Available with either 60 or 80 litre main compartments, the Vango Freedom also features a separate, detachable 20L day pack. Extremely versatile and rugged, this backpack is well is designed and perfect for long distance travellers. It is hydration system compatible and is built with a Quick Adjust Back System for customisable comfort. It also offers air mesh on all contact areas to keep you cool and a flight cover to protect the straps whilst in transit. The Venturesafe® EXP65 is an anti-theft travel pack, perfect for those who are concerned about the safety of their belongings during the travels. Featuring PacSafe anti-theft technology this rucksack comes with a locking cable, a mesh slashguard and a puncture resistant, fully lockable zip. With a 65 litre capacity, the ergonomic, internal frame offers increased balance and support, while the adjustable, padded hip belt adds stability and efficient weight distribution. I’m trying to figure out which one of these would be for me.. Which Jalan do you have? Do you have the 60+15? Is it big enough? I think I would prefer a bit bigger, but then it’s the 70+15 with weels, or the Luxe 70+20, plus they are both a bit more expensive.. It currently holds 22kg. Most carriers only allow 23kg so the size is just perfect. I would recommend it. Has served me well the last 6 months! Do you know if the Gelert Discovery Rucksack has a padded lumbar support & waist belt? The above link only has one photo of the bag from the front and I can’t make out if it does or not? A good list of things to look out for. my only other advice is that once you’ve found what you think will be the best bag for you, use it for long walks or a weekend away, fully loaded. It’s better to find out you’ve made a mistake before you leave so you can flog it on ebay and try again than spend a year with something that just doesn’t work for you. attempting to pack enough things into a hiking backpack to last me for a month in Africa? What an awesome resource! I need to purchase a quality backpack soon and will definitely be referencing back to this. As far as big backpacks go, I think North-face and Katmandu have some really good ones. I have the berghaus jalan luxe 70 + 20, I love all the pockets, compartments, straps, both in main bag and day sack… I used it for a couple of one month trips and storage was great… only thing that bugs me is that I don’t find the straps to be thick enough, when the main bag is fully loaded I find it a bit uncomfortable :/ Don’t know if it’s the bag or maybe I am not packing my things in the right way. I guess my question is, are you sure you’re wearing your backpack right? When you do up the waist strap properly, the weight of the backpack is mostly on your hips rather than your shoulders and upper back. This spreads the weight evenly and is much more comfortable on your shoulders. To be honest, I read so many good reviews about it + it is not that I spend most of the time with the bag on my back, so probably I think I will go with this one, and not buy another, I just really like all the pockets, compartments, etc… I hope it will be the right decision… It feels lie the toughest decision for me 🙂 having the perfect travel bag! I bought the jalan II 60+10 for a good price of 97 euros. Now the mistake i made.. i did not noticed this backpack is designed for womans. They simply did not wrote it down in the discription. Do you know if there are any big differences in the womans and the mans jalan II ? I am 180cm long and 80kg. Very useful post. 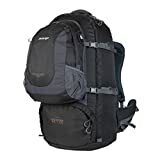 I recently found the Osprey Aether 70l which I really liked, but they don’t do it in Small (my size); only M or L, so having to look elsewhere. Thanks for the recommendations. I badly broke my collarbone in February and now have chunk of metal in my shoulder and a large scar to show for it. Even now carrying a normal rucksack over that shoulder is uncomfortable after a couple of minutes. In 2.5 months we’re off on a round the world trip and one way or another I am going to need to get my kit from A to B. – Won’t fall apart if I spend a lot of time abusing a single shoulder strap. – Has the worlds most padded shoulder straps. – Has a good centre of gravity to put maximum weight through the legs (something like the Karrimor Global Venture above looks like it would constantly try to pull you over backwards… well more than the others anyway). – Hopefully won’t result in me needing a metal added to my spine too. A really helpful guide here, thanks! I think it’s always good to go into a store and try a few out, as everyone will have slightly different preferences and some bags will feel more comfortable that others, depending on your body. I’m going travelling for month to S America – 4 flights – no camping or trekking – but using public transport and staying in 3 star hotels and hostels. So quite a bit of carrying involved. I’m 5′ 7″ and I’m 62 . I’m doing my travelling a bit later in life .. What travel pack or back pack wld you suggest? I guess the best idea is try a lot on ? I’m female. Great article. And thanks for recommending the Osprey Farpoint 55. Looks like the perfect bag for extended travel. I’m looking at the Vango Freedom 60L and wondered if it is big enough to cope with a 3 week trip to Cambodia and Thailand? Hi Trish! 60l will be more than enough! Cool. I’m not very good at travelling light! Hi thanks so much for this. I can’t decide between wheels or no wheels! I’m 57 year old lady about to go travelling for 5 weeks, two weeks by myself. I like the ones with added security and detachable day bags. I’m in Twickenham, do you know of a good place I could go and try some out please? Thank you. 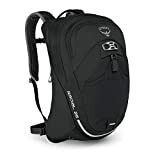 Hi Karen, I always used to have no-wheels and then as I started carrying more gear/equipment I switched to wheels more recently (Osprey Sojourn) and just use another day pack as my carry on, rather than a backpack with detachable bag. There’s only been two occasions where the wheels weren’t useful which was a beach hut where the wheels struggled in the sand (but it does have backpacks straps too), other than that, the Sojourn has been fantastic and it’s been on trips with me to places like Antigua, Bali, Namibia, Hong Kong and the Philippines. If you’re keen on one having a detachable day pack, try the Osprey Meridian. I always suggest buying it online as it’s cheaper but you might be able to find one to look at in Blacks or Millets. Hi,all those information in the post are so useful but aso confusing for me. I am going now for 6months to Austria for work,and I have to pack winter clothes with me.So i think I need a big backpack,but I also would like to go to New Zealand next year for a year,work and travel. 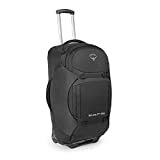 I really like the variability of wheeled suitcases with straps if needed to be carried as a backpack.i am new to travels.i dont know how much stuff tomtake with me and what size or bag would be the best.would you help me please? Hi Ivet, For what you describe the Osprey Sojourn would be a good fit for you as it’s wheeled and has straps if you need to wear it as a backpack. If you’ve got to pack winter gear which tends to be quite bulky, I’d opt for the 80l so you have more wiggle room (it’s the one I use for big trips). Hope that helps.